The Daily Telegraph reports today (Thursday 22 March) that the International Development Secretary Penny Mordaunt has launched an £11 million fund to find innovative ways to deliver aid in war zones. The story follows claims yesterday that a Syrian hospital was deliberately bombed after a suspected computer hack on a British surgeon who was trying to help medical workers in the besieged enclave of Eastern Ghouta. 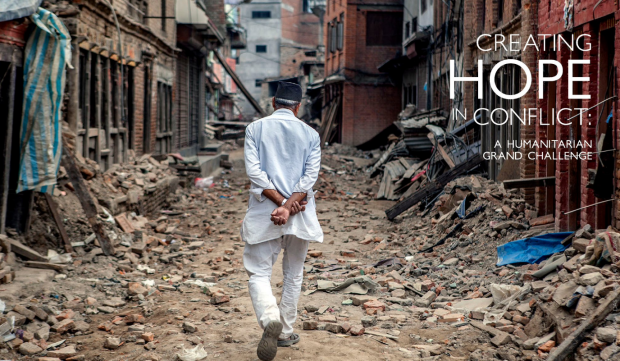 The new Humanitarian Grand Challenges fund, which was launched in partnership with USAID last month, will provide grants to help get innovative projects off the ground, and will provide further support to expand projects that prove the most successful. a way to share information to help people move around conflict zones safely. The fund is open until 12 April 2018 for projects that provide innovative solutions in these areas: health products and services; transmitting life-saving information; providing safe water and sanitation; and energy. “The Asad regime and its backers have displayed an unparalleled level of callousness and barbarity by deliberately targeting schools and hospitals. These attacks, along with restrictions on food and medical supplies, are a blatant breach of international humanitarian law. “The UK government continues to call on all parties to this horrific conflict to protect civilians and we will continue to deliver support to those that need it most. “Brave aid workers, including the medical staff targeted after a suspected computer hack, are working in horrific conditions to save people’s lives. The aid sector needs to innovate if it is to continue delivering life-saving assistance in the most difficult situations imaginable.